It was an interesting and highly contested time for word processors. WordStar lost market share to WordPerfect as the 1980s progressed, only for WordPerfect to follow a similar fate into the next decade. The success of Windows 3.0 was underestimated, and WordPerfect never recovered to its former glory. Word for Windows 1.x was emphasised for taking advantage of the Windows interface, and its WYSIWYG (what you see is what you get) capabilities. WYSIWYG meant no longer needing to use colour coding for representing text that was bold or italic for instance. For the most part, the feature set aligned with Word for MS-DOS 5.5 that it was indirectly in competition with. System requirements were more demanding however, requiring a 286 processor with 1 MB RAM, and an EGA monitor. Disk space after installation was insignificant at below 4 MB. Distribution of Word spans over 3½” floppy disks, or alternatively available on the 5¼” variety. Unlike newer versions for Windows, installation was taken place in DOS. Instead of the usual numerical order when shuffling through floppies, each disk is designated a name and used in the following order – Setup, Program, Help, Proofing Tools, Conversions, and Utilities. If using the high density floppies, only disks named Setup, Conversions, and Utilities are provided. Installing Word for Windows 1.1a from the 3½” 720 KB floppy disk set. Being a Windows 2.11 application, no icons are added anywhere inside Program Manager on a Windows 3.x system. MS-DOS Executive preceded Program Manager, resembling more closely with File Manager. For the uninitiated this meant installed programs weren’t quite as obvious, and you’d literally be trawling through directories to find the wanted EXE file to run. Upon launching Word for the first time, you’re asked for your name and initials. This has no bearing on registering your copy, but for features such as the document summary and annotations. Initially Word displays in Short Menus mode. In this mode, it simplifies the menu options aimed at authors creating no-frills documents such as drafts and letters. 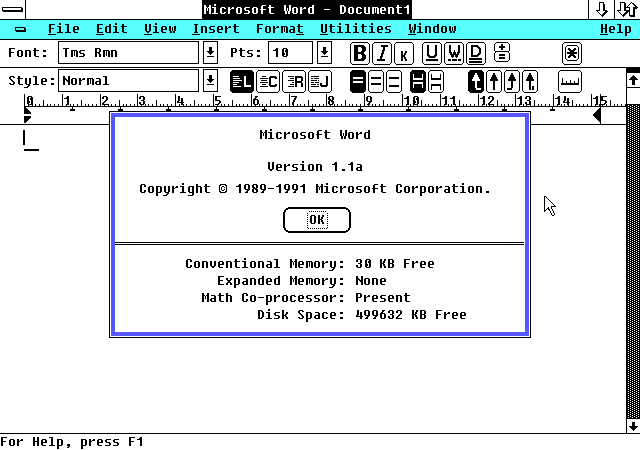 Microsoft Word 1.1a under Windows/386 2.11 in Full Menus mode. Changing over to Full Menus mode via the View menu, this adds the Macro menu and expands the overall options available. These include inserting pictures and indexes, formatting styles for headings and footnotes among others, and revision marking. Curiously the font toolbar was named a ribbon, not to be mentioned again until Word 2007. Almost 30 years on, it really does however show its limitations. You’re only able to undo the very last edit, and it doesn’t work nicely with importing a picture created using Paint, that’s included with Windows 2.11. Paint used the file format MSP, predating the use of BMP for raster graphics. It does work with TIFF, where a sample image is provided of a woman named Monique. OLE (Object Linking & Embedding) wasn’t around then, relying on DDE (Dynamic Data Exchange) for connecting data between documents. A common example was for a bar graph in a Word document to be automatically updated from the linked Excel spreadsheet when data had been changed. By default the only font listed is Times Roman. Other fonts such as those installed with Windows didn’t appear, though manually overriding to Helve allowed me to type in Helvetica. Fonts are in the old FON file format, predating the use of TrueType (TTF) introduced with Windows 3.1, so sizing and printing quality are no where near as polished. Formatting text but alas no fonts to choose from. Also of interest is the general user interface, which reflects the presentation of applications before standard conventions were in place from Windows 3.0. The Help menu for instance wasn’t the norm, and applications that had such a menu would have this placed on the far right-hand side. Dialog boxes would be fixed to the centre of the screen with no title bar, and hence couldn’t be moved. Keyboard shortcut combinations were also unconventional in hindsight. Opening a document was Ctrl+F12, saving Shift+F12, and printing Ctrl+Shift+F12, instead of the familiar Ctrl+O, Ctrl+S, and Ctrl+P respectively. Under Windows 3.x, Word is generally more visually appealing. 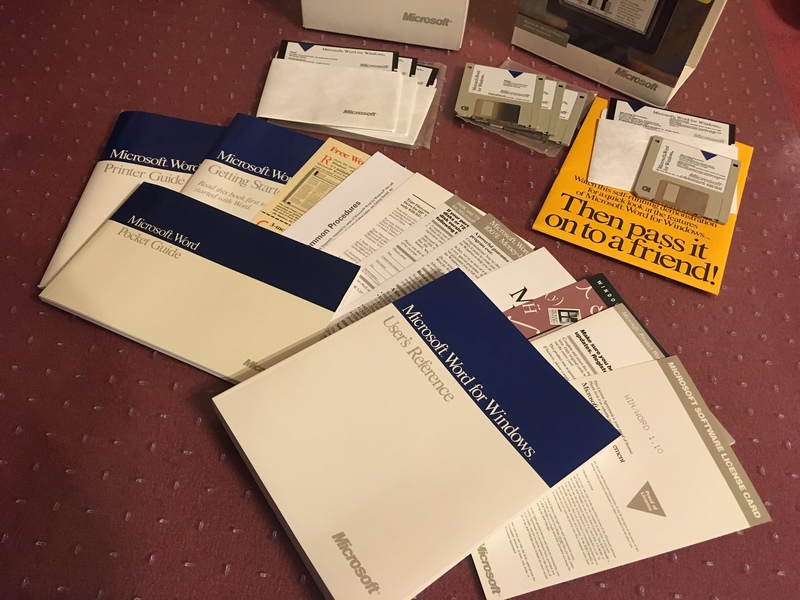 Over time I managed to find two copies of Word 1.1 for Windows, in academic and retail variants. The academic package was of reasonable condition, however the main user guide would seem to be absent. It would only include 3½” 720KB floppy disks, with a voucher for 5¼” disks if required. There was also mention of supporting Windows 3.0 in the system requirements, whereas the retail copy didn’t. 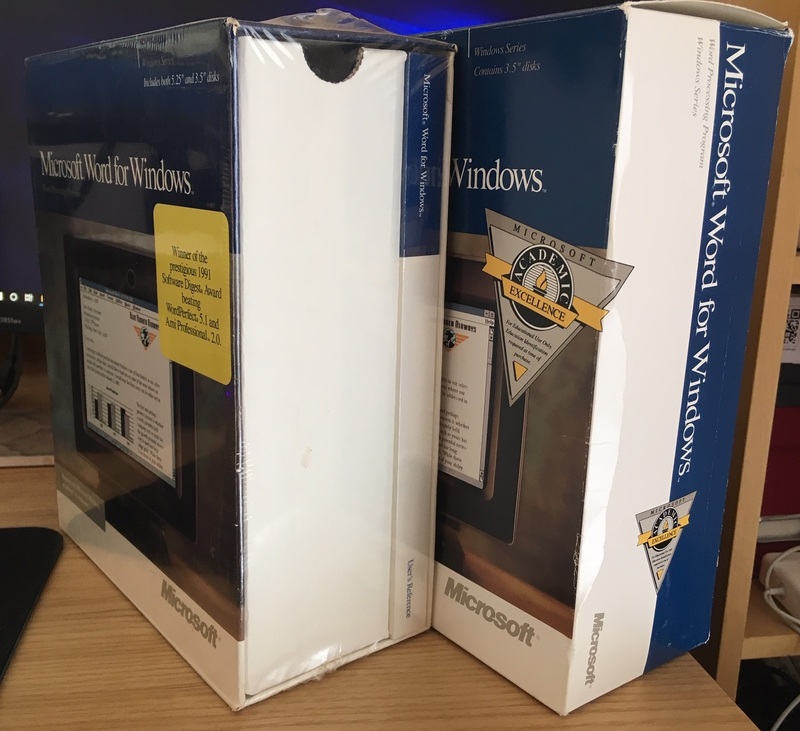 The retail package on the other hand was still in shrink wrap, advertising that Word for Windows had beaten WordPerfect 5.1 and Ami Professsional 2.0 for the 1991 Software Digest Award. This copy also included both the high density 3½” (1.44 MB) and 5¼” (1.2 MB) floppy disks, with a coupon provided for a low density set. Disks had also been included for a “self-running demonstration” as promotional material to showcase the features of Word, and entice your friends and family to buy a copy themselves. Also included is a Keyboard Template for placing along the top of your keyboard. These were a quick reference guide for the various key combinations available. WordPerfect had similar templates, though the concept seems so foreign these days. Microsoft Word Keyboard Template to place on top of your keyboard. Whilst reasonably capable for its time, WordPerfect for DOS was still seen as the undisputed king for serious word processing. It was Microsoft’s first attempt and like many firsts, it usually was worth waiting for Version 2.0.